Several bomb disposal men and two young boys were killed or injured trying to defuse parachute bombs which came down over Wakering in the spring of 1942. One of the more unlikely anti enemy aircraft experiments during the 2nd World War was the use of parachute bombs. These bombs were released all along the east coast with the intention of bringing down enemy aircraft. They were designed to drift high into the air and out to sea. The long wires hanging down from the device was intended to tangle in the propellers of German aeroplanes with the intention of exploding the bombs thus destroying the planes. 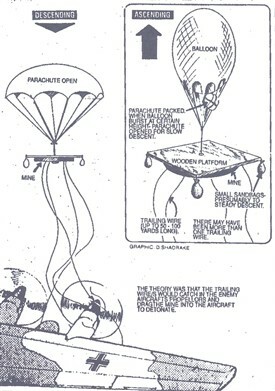 Apart from the fact this seems an altogether crazy idea, in Gt Wakering the bombs were released on their balloons west of the village instead of nearer the coast. The wind took them towards the houses instead of harmlessly out to sea. The long wires tangled in chimneys and telegraph wires as well as coming down in gardens and fields. Two bomb disposal men were killed defusing bombs at Potton Island and many more were injured. Altogether, over 50 of these unexploded devices were found and disposed of in the area. This page was added by Robert Stephen on 13/03/2012. My uncle Bryan Mott was one of the two children killed by a UXB. My mother Barbara Mott, his sister, died when I was 16. The article about him was a great find for me.